Romney and Trump have had a tumultuous relationship through the years. Mitt Romney came to Arizona to help out a fellow Senate hopeful and he ended up getting in a jam himself. 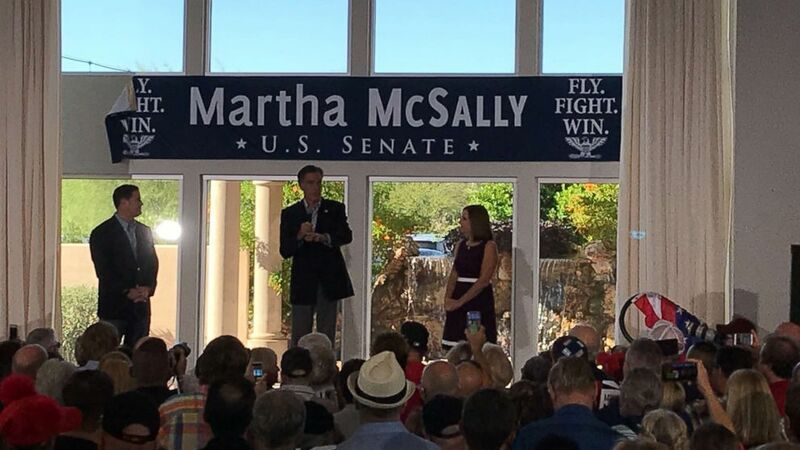 The former presidential candidate and governor headlined a rally for Rep. Martha McSally on Friday in Gilbert, Arizona, to help boost her campaign to fill the Senate seat being left open by Sen. Jeff Flake’s departure, but comments Romney made after the event have drawn some criticism. When Romney was asked what happened with his efforts to stop Donald Trump from becoming president in 2016, Romney denied being a leader in the so-called "never Trump" movement. (Meghan Keneally/ABC News) Mitt Romney campaigns for fellow Senate hopeful, Rep. Martha McSally, in Gilbert, Arizona on Friday October 12, 2018. “I don't think that was the case,” Romney said. “President Trump was not the person I wanted to become the nominee of our party, but he's president now. The policies he's promoted have been pretty effective. And I support a lot of those policies. When there's a place where I disagree, I point that out,” he said. That description runs counter to what many remember from the 2016 campaign. The most notable instance of Romney expressing his displeasure with Trump’s candidacy came in March 2016, when he held a news conference laying out a plan for voters in various states to help block Trump from winning the party’s nomination. Romney’s description on Friday of his role -- or lack thereof -- in the "never Trump" movement is the latest in a tumultuous back and forth between the two men through the years, which included a Trump endorsement when Romney ran for president in 2012 and then the March 2016 bashing by Romney when Trump ran. 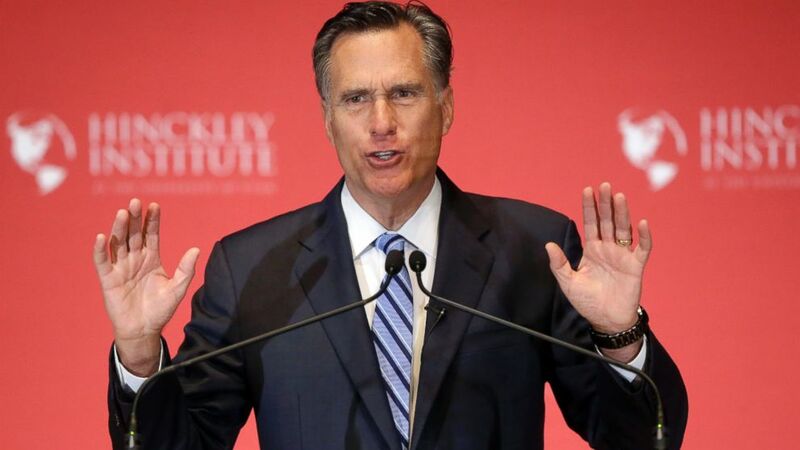 (Rick Bowmer/AP Photo) Former Republican presidential candidate Mitt Romney weighs in on the Republican presidential race during a speech at the University of Utah, March 3, 2016, in Salt Lake City. After Trump won the election, their relationship seemed to be on an upswing when Romney was very publicly considered as a possible secretary of state for Trump, but that soured months later when Romney publicly called for Trump to apologize over his comments about the violent white nationalist rally in Charlottesville, Virginia. Another olive branch appeared to be extended earlier this year, when Trump offered -– and Romney accepted –- his endorsement of Romney’s bid to fill Sen. Orrin Hatch’s seat in Utah.